Homemade guanciale helps make this dish stand out, but thick-cut or slab bacon works, too. 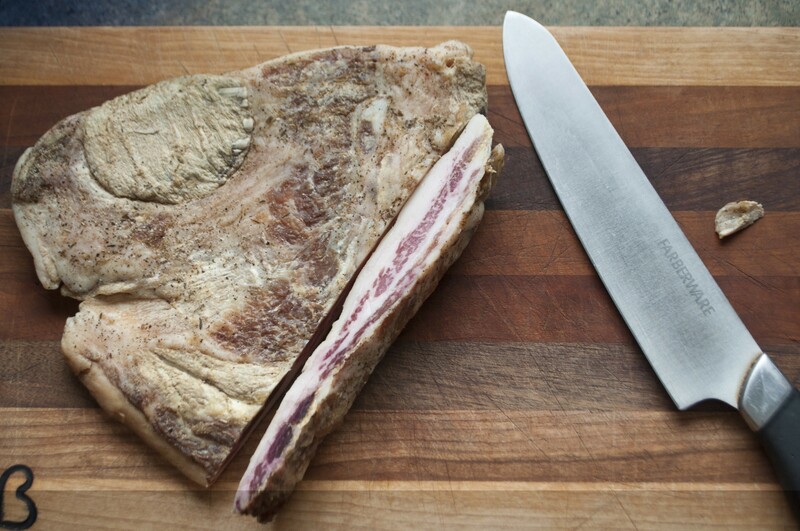 I bought a pork jowl from Pigasus Meats at the Burlington Farmers Market back around Thanksgiving and it's been curing into guanciale (similar to bacon, but dry-cured instead of smoked) in my pantry ever since. I've also been thinking about eggs a lot, which could really only mean one thing: I was going to make pasta carbonara. This classic Italian dish has murky origins. Most people who have opinions on the matter trace it to somewhere around Rome, but exactly where and when it originated is widely disputed. Like all Italian home cookery, carbonara's ingredients and technique vary from kitchen to kitchen. Some cooks use garlic, onions or other allium, while American chefs are wont to add cream or milk, peas or chicken. Often, they'll go light on the sauce and top the dish with a poached egg or raw yolk, adding an extra dose of cholesterol-laden richness. Despite this variety, everyone seems to agree that the dish contains the following: cured fatty pork (usually guanciale or pancetta, but slab or thick-cut bacon works, too), egg and hard, grainy cheese, such as Parmesan or pecorino, and pasta water. Pasta water is the glue that ties it all together. For my version — which I daresay is fairly true to the Roman standard but made with local ingredients — I went with a bit of garlic and that's basically it. Many cooks will sauté whole cloves of garlic with the pork and then remove them before serving, so it's present in scent only. I diced it and left it in the final dish because I'm afraid of vampires. For cheese, I used Bridport Creamery's goat/cow Champlain Valley Tomme. It falls somewhere between a Parmesan-style cheese and something more alpine. Then I added diced scallions for the garnish, mostly because it looked pretty and presentation is half the battle. The real trick is to use great ingredients and to time it all just right. Everything has to be nice and hot — but removed from direct heat — to get the eggs, cheese and pasta water to congeal into a nice, rich, creamy sauce. If it's not hot enough, it'll be like raw egg pasta soup: Yuck. If you don't remove it from the heat, the eggs will scramble. Fried egg pasta — also yuck. But, take the care to get it right and it's a glorious, filling, impressive and surprisingly simple dish. 1/3 cup Parmesan, pecorino Romano or other hard, salty cheese, finely grated. Salt water for pasta and set to boil. Cook the pasta until it's just al dente. For thin spaghetti, this should take about 10 minutes. Heat a large mixing bowl in the oven or with boiling water. It must be nice and hot (but not burning to the touch) to get the sauce just right. In a medium skillet, heat the olive oil over medium-low heat. Add the garlic and guanciale and cook, stirring often, until the pork turns a rich golden color and crisps up at the edges. Cooking time will depend on which meat you're using, but browning should take 10-12 minutes. As the pork renders, beat the cheese and eggs together in a measuring cup. Add the pepper and set aside. When the pasta is ready, save one cup of the pasta water. This is very important! Don't forget to save the pasta water! Drain the noodles and add to the pork/garlic skillet. Toss the pasta with the pork mixture so it's evenly coated with fat. Now, remember that nice big bowl you were warming up? Flip the pasta/pork mixture into the warm bowl. Add the egg and cheese mixture and toss with plenty of verve and alacrity until the pasta is well coated. Then, pour in the pasta water, a little bit at a time, until the egg thins to a nice, light, saucy consistency. 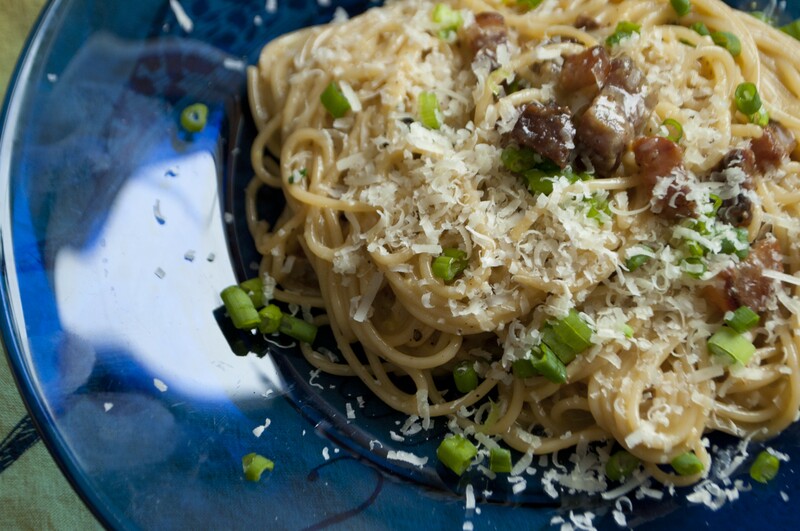 Garnish with scallions/parsley and more cheese and serve immediately. **If you're serving this as a smaller course — and feeling fancy — make little nests with the pasta and top with an uncooked egg yolk before adding the scallions and cheese. When your guests break the yolks, they'll flow into the hot pasta, adding an extra layer of creamy. This addition via Mario Batali, who happens to know a thing or two about pasta — and being fancy.